You have to agree to terms and conditions before making a booking. KST Airporter offers regular door-to-door shuttle bus service between Sydney airport and Sydney CBD, Darling Harbour, and Kings Cross. With almost two dozen buses in our fleet, KST Airporter is the largest shuttle service provider in Sydney. KST Airporter offers customers a quick, safe, and efficient transportation service with our comfortable air conditioned buses. KST Airporter has a variety of buses holding from 9 to 24 passengers making our buses suitable for any group size and any occasion. City Hotels Pickup Times: 05:00 and 18:30. Domestic & International airports pickup times: 06:30 and 21:00, waiting time up to 60 minutes due to traffic conditions. Please give us a call upon your arrival on +61 2 9666 9988. Please book online to guarantee your transfer and minimize your waiting time at the airport. Please look for KST Airporter buses with distinctive Sydney Airporter Logo and KST representatives wearing an approved KST Airporter ID card. Bus departures are on a regular basis from Domestic and International terminals. Please have your shuttle bus tickets ready upon arrival and provide them to a driver when borading one of our buses. 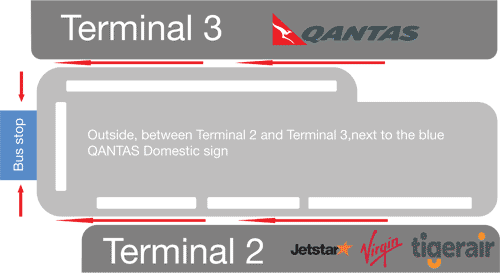 Passengers arriving at Domestic Terminal 2 (Jetstar, Virgin, Tiger, and Regional Express) need to walk outside the terminal, turn left, and walk approximately 50 meters to a bend in the road known as a horseshoe where they will see a big blue Qantas sign. Passengers arriving at Domestic Terminal 3 (Qantas) need to walk outside the terminal, turn right and walk approximately 50 meters to a bend in the road known as a horseshoe where they will see a big blue Qantas sign. Customers arriving at International Terminal 1 please proceed to a Bay 12 located outside the terminal opposite Rydges Airport hotel. Please refer to maps at the bottom of this page for your directions. Telephone booking confirmations are required to secure your seat from a hotel to the airport. Booking confirmations should be made 24 hours prior to your preferred hotel departure. Domestic connection time: Minimum 2 hours before aircraft departure. International connection time: Minimum 3 hours before aircraft departure. Please allow extra travel time during Sydney peak hour traffic on weekdays between 8am and 10am, and between 5pm and 7pm. Our service is non-refundable. You can reschedule your reservation and use those funds on your next travel within twelve months from the day of purchase, provided you give us a call to make a new reservation.